Here's my next postcard for The Craft Barn's Quotes and Lyrics Challenge where the words this fortnight are HEART and/or RISK. After a day or two of looking I found this quote by Matt Smith which I thought was so true but have struggled to create something to illustrate it. In the end I've delved through my half made box of 'artistic ventures' and chose this piece. I've used a set of Firework stamps from Oak House Studio, inked in various pigment inks and clear embossed. 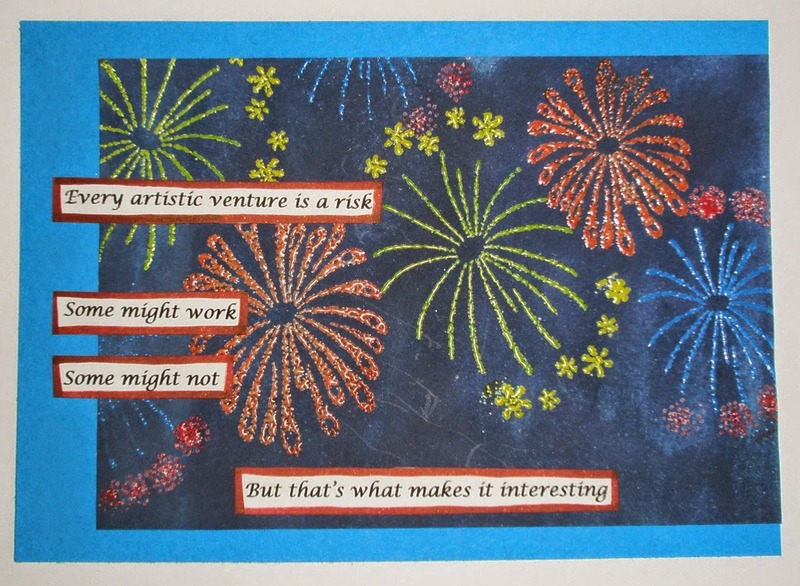 It's then coloured with Chipped Sapphire Distress Stain to make the fireworks pop and finished with the printed quote. I can't believe we have only one more pair of words to do but I'm looking forward to what the Craft Barn's Challenge will be next year. Many thanks for looking and for all your lovely comments. Doesn't time fly when you are having fun... I can't believe we are close to the finish line! Love your fireworks! Great firework display! Love the quote too. I think this was a great way to illustrate these very true words! This was such fun, and I really appreciate all your kind comments. Love the fireworks and a great quote. That's a great creation, the fireworks looks wonderful. When I enlarged the card, the fireworks nearly flew off the page. That embossing powder really did the trick. I really like that quote, too. It reminds me of these Craft Barn challenges we have taken this year. And that has DEFINITELY made it interesting. We should all have that quote on our craft room wall! Love the fireworks.